The perfect waterfowling spot isn't always easily accessible without some creative brainstorming. A good boat to get you there and a good blind to keep you hidden is a must. For the 2010 Wildfowl Boats & Blinds Contest, our readers showed off their best homemade creations to get to the birds, and we've selected our favorites. Grand-prize winner Herb Ward of Brandon, Miss., took home a deluxe prize package for his substantial water blind made of building scaffold. Ward, a safety director at a builders and contractors association, created a substantial blind that is safe, sturdy and easy for any hunter to replicate. His impressive creation earned him the grand prize package of an FA Brand Eliminator SUB blind, a 6-pack of FA Brand Last Pass HD Field Honkers, a 6-Pack of FA Brand Gunners HD Floating Mallards, an FA Brand Stands-A-Lone slotted decoy bag, a Sean Mann Eastern Shoreman Guide XT acrylic Canada goose call, a case of Black Cloud Federal Premium shotgun shells and a 1-year subscription to Wildfowl magazine. The second-place prize goes to Aaron O'Brien of McHenry, Ill., for his welded aluminum duck boat with a snowmobile motor that stands in for a mud motor. 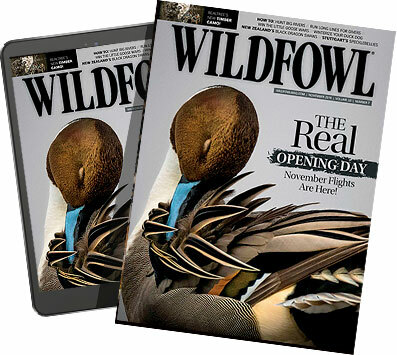 He will receive a 6-pack of FA Brand Last Pass HD Field Honkers, a 6-pack of FA Brand Gunners HD Floating Mallards, an FA Brand 6-slot full-body goose decoy bag, a case of Black Cloud Federal Premium shotgun shells and a 1-year subscription to Wildfowl. The third-place package is extended to Murney E. Lewis III of Great River, N.Y., for turning two Sunfish sailboats into a single duck boat. He won one dozen FA Brand Gunners HD Floating Mallards, an FA Brand Stands-A-Lone slotted decoy bag, a Sean Mann Double Trouble Guide XT Timber acrylic duck call and a 1-year subscription to Wildfowl. To read about their creations and the Honorable Mention winners, check out any issue of Wildfowl magazine this year. To submit your own entries for 2011's contest, mail photos of your boat, blind or modification to a boat or blind to Boats & Blinds Contest, C/O Mike Marsh, 1502 Ebb Drive, Wilmington NC 38409.